OER HUB Research Kit: The OER Hub toolkit contains a set of resources for anyone conducting research in open educational resources. GitBook: An open text platform that can sync content with Github. MathBook XML: A lightweight XML application for authors of research articles, textbooks and monographs. Also has a recent and promising integration with WeBWork. Standard eBooks: Public domain ebooks from sources like Project Gutenberg with “carefully designed and professional-grade” typesetting and formatting. Wikimedia Image Attribution Tool: Automatically generate proper attributions for Wikimedia Commons and Wikipedia images. 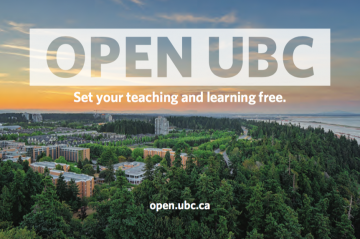 An emerging motivation for uptake of open education resources and practices at UBC is the increased presence of University policies and programs that support OER. The 2016/17 edition of the Guide to Reappointment, Promotion and Tenure Procedures at UBC (pdf) includes contributions to open educational resources and repositories as a possible criteria for evidence of educational leadership (p. 16, 19 & 51) for those instructors in the educational leadership stream. I believe that the inclusion of open resources and repositories in a promotion and tenure guideline is pretty unique at this point (although many institutions have open access policies). Additionally, both the 2018 UBC-V Teaching and Learning Enhancement Fund and the 2018/19 Aspire Teaching and Learning Fund at UBC have priority focus areas for the development or integration of open educational resources that are intended to be used in a course, multiple courses within a program, or across several programs. The 2018 TLEF call for Large TLEF proposals is now open and letters of intent are due July 14, 2017. Education either functions as an instrument which is used to facilitate the integration of generations into the logic of the present system and bring about conformity to it, or it becomes the ‘practice of freedom’, the means by which men and women deal critically with reality and discover how to participate in the transformation of their world. Recently, the UBC Library hosted an open mic event on Freedom of Expression in the Post Truth Era and I had the opportunity to listen to amazing students, professors, librarians, and poets reflect on the state of truth and knowledge in today’s world. As I listened, I was reminded of Freire’s framing of education as a means to “deal critically with reality” – a framing that I think gets to right to the role of the university. If we are, indeed, in a post truth world, it’s not simply enough to read, learn, or know something, we also have to be able to critique and evaluate what it is and how we know it. Lately, I’ve been involved in a number of conversations about how to embed digital literacies into curriculum; put simply, how do we help students learn the skills needed to evaluate whether something is true or not? I often promote the pedagogical model known as the student as producer model. This model came out out of a project at the University of Lincoln where they were shifting from research informed teaching to research engaged teaching; I partly interpret this as pushing the values and processes of research into the undergraduate curriculum. Why this model is important is that I think that many aspects inherent in research lend themselves to the sort of competencies involved in critique and digital literacies. What I enjoy about these strategies is how common they are to research. Knowledge is not created in a vacuum and research is often a critique on the current understanding. Writing a literature review is an exercise in evaluating sources, following the discussion, and trying different search approaches to find additional context. Publishing research is the act of creation and the act opening ourselves up to critique. Embedding the values of research into teaching and learning embeds the processes of acquiring digital literacies into the student experience. Martin Weller writes in his open textbook The Battle for Open that, increasingly, the narrative around the role of the university is “one of a straightforward investment transaction – students pay a certain fee, and in return they receive an education that will allow them to earn more money later in life.” However, if this becomes the prevailing role of the university, I think we all miss out. We must value inclusivity and empathy and we must also promote critique. We should question what we know and how we know it, so, as Freire wrote, education becomes the practice of freedom.